Silver Springs Moran Hotel offers a fantastic wedding venue with the wow factor. Whether you are looking for a small intimate or large wedding Silver Springs has something for everyone. Surrounded by landscaped gardens there is plenty of outdoor photographic opportunities. 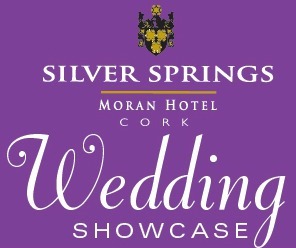 On the 26th of January Silver Springs Moran Hotel will host their Wedding Showcase from 5.30pm – 8.00pm. This show case will allow brides and groom-to-be to preview the hotel as it would appear on their wedding day. Join us on the night and enjoy complimentary canapés and prosecco! *Terms & Conditions apply. In association with Ted Dunne & Crux Entertainment! The Silver Springs Moran Hotel is one of Cork’s most popular wedding venues! This February one lucky couple will win a wedding package for 100 guests! This includes: 4 Course Dinner, Wine, Room Hire, Arrival Reception: tea, coffee & biscuits, Evening Food, Chair Covers, Red Carpet Arrival, Table Plan, Place Names, Personalised Menus, Keep Sake for Bride and Groom, Floral Displays, Special Accommodation Rates For Guests, Dedicated Wedding Coordinator, Bridal Suite, & No Service Charge. You must be present at the Wedding Show Case on the 24th of February to claim this amazing prize!